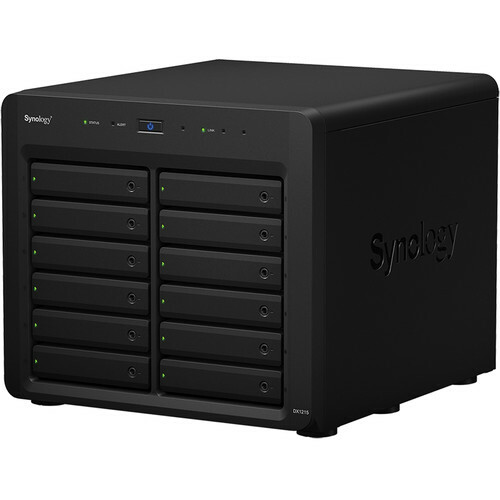 The DX1215 12-Bay Expansion Unit from Synology delivers volume expansion and data backup for the following selected Synology DiskStation servers: DS3615xs, DS3612xs, DS3611xs, DS2015xs, and DS2413+. There is also a DSM version requirement of 5.1-5004 or later. The DX1215 provides an additional 12 drive bays that support SATA III 6 Gb/s and SATA II 3 Gb/s 3.5" hard drives, as well as 2.5" hard drives and solid state drives. When used with Synology DiskStation Manager (DSM), RAID management is possible and a RAID volume on your Synology DiskStation can be expanded directly without having to reformat any existing drives. This helps to ensure that your DiskStation continues to operate while its capacity is being expanded. The DX1215 can also act as a dedicated local backup solution for a Synology DiskStation. When created as a separate volume, the DX1215 helps to provide a backup solution for local drives in case of a system failure. In addition to RAID management and local backups, online volume expansion is also supported. To connect to the DiskStation, the DX1215 uses a secure and specially designed expansion cable that connects to its Infiniband port. This helps to ensure not only a simple connection, but maximum data throughput. The 6 Gb/s connection speed allows the drives in the connected DX1215 to operate as the internal ones of the DiskStation. The DX1215 also has a hibernation mode that can be manually configured to automatically start when the system has been inactive for a period of time. This not only helps to save energy, but also helps to extend the lifespan of the internal drives. The DX1215 will also intelligently power off with the attached DiskStation, helping the system to run smartly and efficiently with minimal user intervention. The DX1215 has an integrated and fast detachable fan module with dual 120 x 120mm fans and screwless drive trays, allowing system components to be replaced quickly and without any tools. The DX1215 12-Bay Expansion Unit operates on 100 - 240 VAC on 50 to 60 Hz, single phase. Included with this unit is 52 x 2.5" drive screws, 2 x drive tray keys, an AC power cord, and an Infiniband expansion cable. Box Dimensions (LxWxH) 18.5 x 17.0 x 16.5"
DX1215 12-Bay Expansion Unit is rated 2.0 out of 5 by 1. Rated 2 out of 5 by Bernd from extremely slow and way overpriced I purchase done of those to move a growing storage pool into this units and expand this pool to 8 drives. Once it was done I ran a few tests, especially speed tests. I have to mention that the main unit here, a DS3018 is connected via a direct 10g connection and was able to transfer date with very high speeds to and from the connected MacPro 5.1. Long story short: If you are using your NAS for production in film and photo and require high connection speeds via a 10g networks stay clear of this expansion unit. My write speed dropped about 20% and the read speed is now much slower than write, actually about half the write speed. According to Synology customer service this is normal as the bandwith of the so called Infiniband doesnt provide more than SATA II speed (even though I hope the customer service person made a mistake and meant to say SATA III). Unfortunately Synology fails to mention that anywhere in the specification of this product. Synology actually makes us believe that a drive entered into the expansion unit works the same way as one in the main NAS. Given the really low specs of the unit and its connection I find this product extremely overpriced given that this is nothing but a dumb and rather slow case for 12 SATA drives. If you are running out of space consider buying bigger hard drives instead of this product.